The MicroSlicers™ allow to cut sections of soft tissues like brain, liver or similar difficult-to-section material. The MicroSlicers™ are well known for their quality and superior performance, enjoying an excellent reputation in the neuroscience research community. The MicroSlicers™ have a unique design for the vibratory motion of the cutting blade. To generate the shuttling blade motion in the MicroSlicer™, a smooth motorized system was adopted that is less prone to vertical vibration, compared to the traditional electromagnetic vibrating system. Traditional electromagnetic system is limited to a set constant vibration frequency of the blade. In contrast, the MicroSlicer™ allows adjustment to the shuttling frequency of the blade depending on the properties of the specimen. Thus, the MicroSlicer™ can cut thinner sections more easily and efficiently. The MicroSlicer™ is an instrument designed to cut sections of animal or plant tissues, fresh or fixed, without freezing them. Various fields of neuroscience, histochemistry and cytochemistry require incubation of tissues in different incubation media. Large tissue blocks and thick sections often end up with non-specific deposits of reaction products and areas of no reaction in the center of the specimen. This is due to poor penetration of the reaction media into the tissue. For this reason, thinner sections are preferred to perform histochemical and cytochemical reactions. The simplest method to cut tissue sections is to cut frozen in a cryostat. However, it is well known that both cellular fine structure and enzyme activity suffer greatly from freezing and thawing. Nonfrozen sections are therefore preferred for histochemistry and cytochemistry. In recent years, rat or cat fresh brain sections (200 to 500 micrometers in thickness) have been used in neurophysiological and pharmacological research. In addition, tissue sections are used in a variety of studies in the field of botany. Traditionally, non-frozen tissue sections have been cut by hand with a razor blade or by using microtomes or tissue choppers. However, these methods have various drawbacks, such as the irregular thickness of tissue sections, difficulty of obtaining thin sections, or extremely slow sectioning speed. The MicroSlicers™ are instruments for preparing non-frozen tissue sections easily and efficiently. The MicroSlicer™ vibratory tissue slicer systems feature a fixed cutting amplitude and an adjustable frequency. Even the entry level model, DTK-1000N, comes equipped with an auto-reverse mechanism and detachable bath. In addition to that, the Zero 1N has a stepping motor for vertical movement of the specimen, as well as a retraction function. The Zero 1N model features the MicroSlicer™ Zero-Z technology with a redesigned cutting head for dramatically reduced Z-axis vibration. The layout of the switches on both sides of the tray allows for easy operation and reduced spillage on the controls. 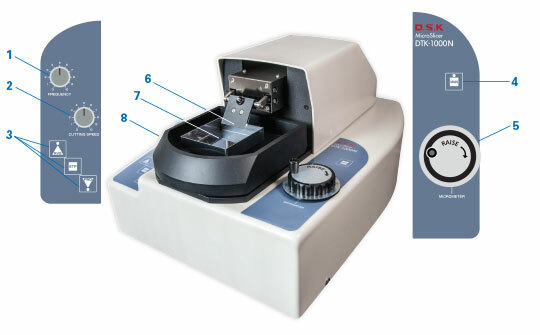 A robust, manual, entry-level microtome ideal for a busy laboratory with many users. 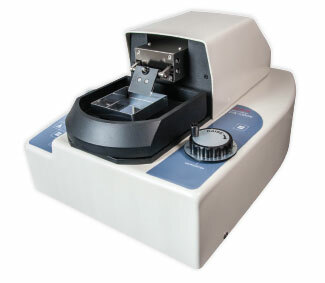 10000N MicroSlicer™ DTK-1000N, 120V, 60Hz each P.O.R. 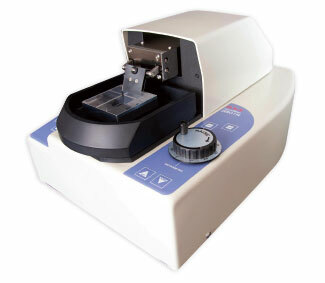 10000N-220 MicroSlicer™ DTK-1000N, 220V, 50/60Hz each P.O.R. This model MicroSlicer™ with Zero Z technology dramatically reduces the Z-axis vibrations to approximately 2.5 microns. It is also equipped with a specimen retraction system. The specimen advance is manual, but the specimen can be moved up or down by a motorized button. A function switch can stop, advance or retract the cutting action, saving valuable time. 10111N MicroSlicer™ Zero 1N, 115V, 50/60Hz each P.O.R. 10111N-220 MicroSlicer™ Zero 1N, 220V, 50/60Hz each P.O.R. The retraction mechanism is a function included in the Zero 1N model that prevents the retracting blade from touching the face of the specimen. The specimen tray is lowered by 120 micrometers after the cutting of each section and is raised by exactly the same distance when a new cutting cycle starts. Fits MicroSlicers™ above. Does not fit MicroSlicer™ 1500E. Fits the new models DTK-1000N and Zero 1N. Does not fit DTK-3000W and older models. The removable bath can be chilled in a freezer for additional cooling power. 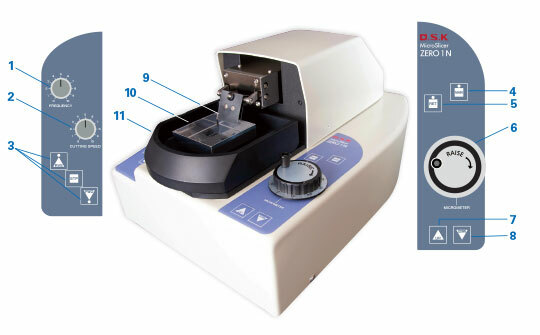 Thus it is convenient to have more than one bath for the MicroSlicer™ DTK-1000N or Zero 1N . Fits the new models DTK-1000N and Zero 1N. Does not fit DTK-3000W and older models. The redesigned tray is deeper (15mm) and is attached to the instrument by magnetic force, allowing for easy and flexible orientation of the specimen for sectioning. 10113N Specimen Tray for MicroSlicer™ DTK-1000N and Zero 1N each P.O.R. Fits MicroSlicer™ DTK-3000W and older models.